Lower spare tire for access to winch mechanism and winch tube. 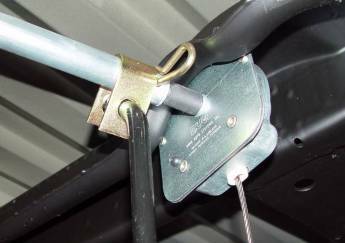 Place the U-shaped bracket over the winch tube, with the round hole in the bracket leg facing toward the right side the truck. Hold the lock bar horizontal and let the flat machined end engage the round hole in the bracket. Rotate the lock bar until the flat machined end is aligned with the flat sided hole in the opposite leg of the bracket and then pushing the end of bar through flat sided hole and letting the lock bar swing downward to a vertical position which will lock the end of the bar into the U-shaped bracket. Raise the spare tire while guiding lower end of the lock bar through the lug hole least obstructed by the winch cable mounting plate in the center of the wheel. Prevent spare tire from rotating to insure that the lock bar remains vertical as spare tire is returned to the full up/stored position. (1)Remove the key from the lock cylinder. (2)Place the Black Max lock assembly over the end of the lock bar with the bar cover/seal end up. (3)Slide the lock assembly upward against the tapered surface of the lug hole. (4)Press inward on the "Press To Lock" button while holding the lock assembly firmly against the wheel to engage the dead bolt lock mechanism with the lock bar groove.